Sometimes it’s not just complicated. It’s more than that. 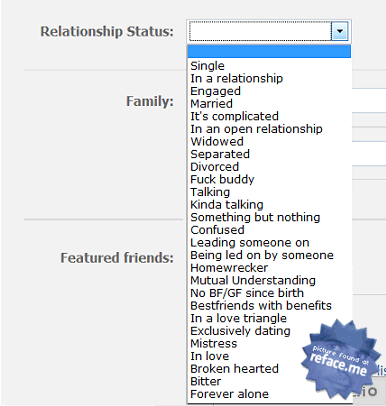 We talked about missing relationship statuses before, but here’s a mockup of how the relationship status menu options would look like if it covered more love life scenarios. 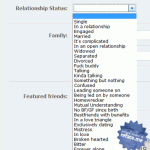 Refacer Ivo recently commented on our post about the polyamory status with a tip how to actually have custom relationship statuses with multiple people on Facebook. 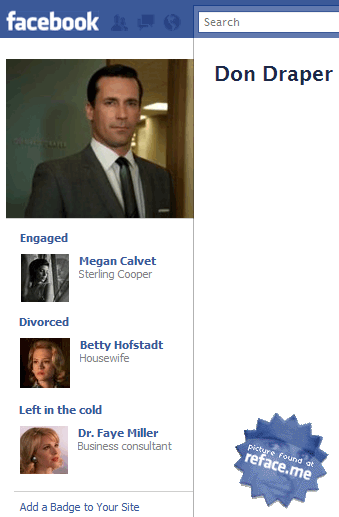 Go to the Featured people tab in your profile editor. Select the person(s) you want to include in this list and click “Create list”. Now save the changes and go back to your profile to see the result. You can create multiple lists, but please be aware that the persons you add will receive a notification about being included so you can NOT do this covertly. Finally, an example of how Don Draper would do it, even though he seems to be forgetting ‘a few’ women. Posted by Pieter on February 14, 2011 at 9:10 PM. Use this trackback if you're linking this story.